Now, I don’t normally write here about stuff that I’m genuinely into but this time I’m going to make an exception. This isn’t the Author speaking, it’s just me, the author. So, deep breath and off we go. First of all, what is a crest or a badge? Well, it’s easy, the badge represents what we are, like a uniform: you wear it, so that your comrades know you’re on their side, right? No not right, because if the purpose of the badge was simply to identify each other as Evertonians, we could’ve just written “Everton” on our shirts, or we could’ve gone with a simple drawing of St Rupert’s Tower. It doesn’t have to look good, it just needs to be unique. You could also easily argue that, considering what we put up with every day, Nil Satis Nisi Optimum would be highly ironic a message to choose. But what the badge actually represents is how we want others, outsiders, non-Evertonians to see us. And once you realise that, you’ll also realise that there’s almost never a good reason to radically change your crest, special circumstances aside, like if your current badge is embarrassingly hideous (as this new one is) or if you win a tenth champion’s medal and you want to incorporate a star into it (an unlikely scenario for us). Of course people at Everton must know this too, after all, it’s not rocket science and they can’t have all gone mad simultaneously. And indeed if we look at the press release, there’s the answer to the why. So there you have it, not much reading between the lines is required to realise that our new crest was designed and forced onto us by Nike, presumably to drive down production costs. As you probably already know from the leaked photos, we’re planning to put a new crest on our shirts from next season. The purpose of this is to make embroidering it easier, cheaper and the result more uniform. It wasn’t a decision we took lightly but our commercial partners convinced us that this is the best way forward. Needless to say that this change doesn’t affect the official crest, which remains the same as it has been for over a decade, and will continue to be used on our website, letterheads and any other non-merchandise material. There, it wasn’t that painful, or was it? After all, it’s not even the new design itself that is so irritating, it’s the happy-clappy campaign that has gone with it and the insinuation that it’s for our own good. The ability and the urge to make lists is probably one of the things that makes us human. It’s easy to imagine that well before inventing chipped stone tools or language our early hominid ancestors had already been compiling lists of the ten prettiest females in the savannah, the twelve tastiest species of hooved animals or the five worst things to do when ambushed by a predator while taking a dump. This means that by now almost everything has been compiled into lists, even lists and probably lists of lists too. Almost everything, but not quite everything, because there are things that are just too ordinary and average to make it to either a best-of or a worst-of list. In particular, there are things that are definitely not pleasant but at the same time extremely trivial, nowhere near awful or important enough to have a moan about it. Not even on the Internet or in Britain. And I think that’s rather harsh, why shouldn’t they have their own list too?. So with that in mind, here’s my list of mildly annoying things. Realising that the incredibly dumb forum post that you wanted to reply to is three years old. Missing a bus but knowing another one will be around in five minutes. Having to repeat the punchline of a joke because the sound of a passing lorry drowned it out. Discovering that someone left the door of the office fridge slightly ajar. TV ads being slightly louder than the programme. A tiny speck of toothpaste on your shirt that you only notice in the afternoon. Forks that are bent out of shape. Forgetting the password of an unused bank account. Realising that the incredibly dumb forum post that you wanted to reply to is three years old and yours. Code reuse has been one of the most persistent buzzwords of software development for as far back as I can remember. It seems to be the sensible thing to do, after all, we’re doing it all the time with our own code, we’re using third-party libraries written by dedicated but random people across the world and it’s all fine. Why is it then that in a corporate environment what starts out as “Share and Enjoy” often turns into “Go Stick Your Head in a Pig”? 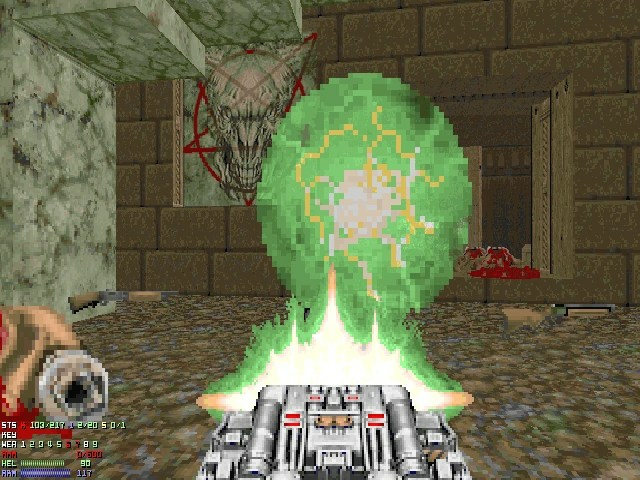 The symptoms are varied but all too familiar: after a brief honeymoon people discover that changes in shared code result in cascades of bugs, then either a multitude of near-identical copies of the same code spring up or a paralysing fear creeps over the department, locking every system into using sub-standard code. Either way, after a couple of years nobody quite remembers what had happened, and memory only survives in the form of rituals and taboos. As far as I can tell, there’s only one fundamental difference between successful and unsuccessful code reuse: knowledge of purpose. Failed attempts always turn out to be based on behavioural similarities only. Successfully shared code serves a clear purpose and that purpose is known to all parties, authors and (re)users alike. And that brings me nicely to the second part of my rant: in-code documentation. Why is it that we so keenly document what a piece of code does but very rarely state its purpose? When you think about it, it’s quite stupid: after all the code tells exactly and quite clearly how it works and if it doesn’t, you should concentrate your efforts on fixing your code instead of building a palisade of excuses around it. Purpose, on the other hand, is not evident from the code itself, and needs to be specified explicitly. Purpose is also less likely to change over time, so the chance of finding out-of-date comments (yet another pet hate of mine) is reduced too. Only code that not only looks like doing what you want but actually serves the same purpose too should be reused. No matter how tempting the functional similarities, it should be avoided. Make a copy and modify it if that makes you any happier, but since typing the code is probably the least time consuming part of development, it’s rather pointless. I know this sounds like stating the bleeding obvious, but my experiences suggest it isn’t. Having said that, it’s not always easy to tell purpose and behaviour apart. And when you spend several years at school learning that natural phenomena don’t exhibit a purpose, it’s even harder. But this doesn’t change the overall picture: if you can’t reliably establish the purpose of a piece of code, don’t reuse it. It’ll end in tears. Don’t say you haven’t been warned. There’s no punchline to this one. There’s no tool either* that would aid in documenting purpose and searching or managing reusable code bits and I don’t even know exactly what such a tool would look like but I know there bloody well should be one. *At least none that I know of and would work on Java code. I know literate programming has a partial answer to some of these problems, but I find the idea of writing what’s when all’s said and done invalid code unacceptable in the age of modern IDEs. The idea behind fallacy spotting is simple: you just try to catch the author of a text trying to use illogical (and therefore illicit) means to prove his point. And there’s no better training ground for the novice fallacy spotter than political rhetoric; the source material is abundant and the frequency and variety of fallacies is so bewildering that even the untrained can spot a few straight away. Probably the most rewarding situations are that of a government official caught in an incompetence-complicity trap. That is, if he knew about the wrongdoings going on in his organisation, he’s complicit and must resign, but if he didn’t, he’s incompetent and must resign. All we have to do is sit back and watch him trying to wriggle free. A more subtle mistake is accusing another party of being divisive. “The other party is divisive, ours isn’t”, goes the well-known line. Never mind the faint but piquant odour of self-contradiction it radiates, but if your party isn’t trying to divide the general public, then what exactly IS your party doing? Which is brilliant, because we’ve never had Cartesian politics before. However, not even the strongest and most impeccable reasoning can avoid being crushed under the jackboots of bureaucracy. 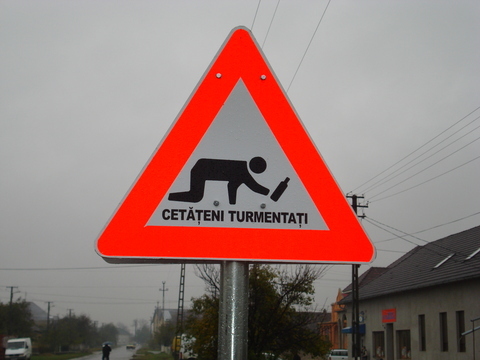 The mayor of a Transylvanian town called Pecica ordered the installation of new, highly expressive road signs warning motorists of drunken citizens crossing. He argued that even though ideally the drunk should be warned, in practice this wouldn’t work, on account of them being, well, drunk. So up went the road signs in the name of public safety and common sense over the letter of the law. Sadly, the signs cannot be seen anymore because the local police claimed it was violating EU regulations and suggested a much less inspiring “Other dangers” sign. Sometimes you just can’t win.